Should I Recycle Envelopes with Plastic Windows? Home > Living > Recycling > Can You Recycle Envelopes With Window In Them? We once heard that throwing just a small amount of unrecyclable material would screw up the recycling process and cause the entire portion of recycled material to go to waste. So for a long time, we would spend tedious hours cutting out the plastic windows from envelopes to make sure no non-recyclable materials got into our recycling bin. After a while we got fed up with all the time this process took, thinking – “why should we have to spend hours to make up for the credit card and other advertising companies’ neglect of the environment?” Well, after some research, it looks like some recycling facilities can process those little plastic windows. So are envelopes recyclable after all? You can recycle paper envelopes but may be able to recycle envelopes with windows too. Current research indicates that post-consumer paper mills have systems that can remove small amounts of contaminants. That is, the little plastic windows still aren’t recyclable, per se, but they should be able to be filtered out by the recycling system. This way you can spend your hours on other environmental endeavors that otherwise would have gone to tedious envelope window cutting. Double check with your local recycling authority to see if this is an option in your area. If it’s not, recycling systems are being updated all the time, so make sure to check back regularly to see if anything’s changed. 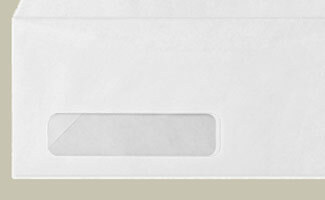 Envelopes with Window: Is Cellophane Recyclable? Can envelopes be recycled if they have a cellophane window? It’s a good question and a good rule of thumb when trying to decide whether or not a paper or cardboard is recyclable, is first to check to see if there’s a recycling symbol (with a number in the center), somewhere on the material. Note: the number inside the recycling symbol is important – most local recycling facilities can process #1 and #2, but check with your local recycling authority to confirm recycling capabilities for #2 – #7. If for some reason your curbside pickup can’t recycle a number, check with your local grocery store or other merchants (such as Whole Foods) that may accept it. What if There’s No Recycling Symbol or Number? Let’s say you can’t find anything that indicates if it’s recyclable (or the recycling symbol contains no number – for example, if it’s from another country), it could simply mean the manufacturer didn’t take the time to print a recycling symbol on there. A good rule of thumb is to test the paper for a waxy or plastic feel – this paper is not recyclable. However, if the chipboard is cardboard on one side, as with a cereal box, then you can recycle the box. The idea is that the paper mills can filter out contaminants, but it doesn’t do you good to recycle the paper if it’s entirely plastic-based, such as is often the case with frozen food containers. Or Don’t Recycle Plastic Envelopes At All? Keep in mind that recycling is not 100% efficient – you’re still creating some waste and using energy during the recycling process. Before you recycle (or toss), ask yourself if you can somehow reuse the item you’re thinking about throwing in your recycling (or trash) bin. If you can, then you’ve done even better – you’re reusing your item, thereby creating no additional waste or energy use. An example of something that we reuse are tennis balls – we take them to the local YMCA and donate them for use strollers for handicapped people. That not only prevents them from having to buy new tennis balls, but keeps our old tennis balls from ending up in a landfill. Wondered what happens to your envelope with window after you toss it in the recycling bin? Watch this quick minute video from the Department of Public Works in Kent County, Michigan to see what goes on behind the scenes. Have you been tossing all that junk mail or recycling it? Best Online Thrift Stores & Consignment Websites: Swap vs ThredUp vs Poshmark vs Tradesy vs RealReal & More! I carefully tear out the plastic windows in envelopes, leaving none with the paper. I receive an average of 2 or 3 per day (mainly environmental charities) and it only takes a few minutes. (Probably it would be quicker with scissors).Then I can put the uncontaminated paper in the paper recycling and the plastic in the soft (“scrunchable”) plastic recycling. You can test if it’s cellophane (made from plant material and recyclable with the paper) or plastic (made from petrochemicals) by tearing it in one direction and then again at a right angle to the first tear. If it tears cleanly and easily in both, it’s cellophane, if it tears easily in one direction but resists in the other, it’s plastic. Most these days are plastic, very unusual to find cellophane. I try my best to recycle everything I can, like paper and aluminum cans. But it’s hard to know if it’s okay to recycle certain things. It’s so interesting the the recycling system can filter out the plastic windows of an envelope. It’s kind of difficult to determine what the little windows are made of: is it plastic, cellophane, or what? If you cut them out, what do you do with the cut-out windows? My decision is to recycle the whole envelope. If indeed there is a material in the envelope that needs to be filtered out, I assume the recycling facility is more efficient than I am at doing so. Make sense? the question remains, what is most beneficial to the environment, to include the envelopes with plastic and decrease the efficiency of the recycling operation (more energy required, lower quality output, etc) or to exclude those envelopes from the recycling? We need input from the recyclers to answer this question. We devote a lot time recycling our waste, but my work mates and I want that our children have a better world in which we can live in harmony with the environment. Earth-friendly biodegradable plastic window film: Multi-Plastics, Inc based out of Columbus, OH has developed a “Biodegradable” plastic film available to the envelope manufacturing industry named: “Envirosafe”. Hopefully, one day this film/type will be the industry standard and the plastic windows in envelopes will be a non issue. you state they are developing a biodegradable film..the discussion is dealing with recyclability…how does this biodegradability improve or degrade its recyclability? This article makes me see how little I know about recycling. I mean, I never thought about the little plastic windows. I guess I just figured that all recycling facilities did process those things out. That is so understandable that you guys would cut them out before sending them out though. Calling the recycling plant beforehand is a good idea to make sure that they have the capability to process the plastic. I did not realize that the plants would not just process this type of plastic along with all other plastic. However, I have to admit that I probably have a dreamed up idea of how a recycling plant works. I just thought the machines just sensed and separated I guess, but technology like that would really cost a lot of money, that most counties and towns probably would not spend on a recycling plant, so I guess if you think it through, it is not realistic. I think many people feel that as long as they separate paper and plastic into bins, and recycle everything that they can, that this is all they need to do, but there always seems to be more to learn when it comes to this. I like that you included the part about reusing in your article and gave the tennis ball example. There are many ways that we can reuse things if we really stop and think about it before we throw stuff in the garbage. However, it sounds like something that is good to do, and it also sounds easy to do, but when you have a busy household with lots of things going on, trying to figure out ways to reuse items can seem like a chore, but I guess every little bit helps. There were a number of interesting take a ways from this article. For starters, I learned that many recycling centers are able to remove the small amount of plastic windows from envelopes. I had long suffered from the common myth that these envelopes must have their plastic removed because it would mess up the recycling process. While we are not sure that this was ever a myth or not, it seems that most facilities are quite capable of removing small amounts of contaminants. This plastic would qualify. No, the center most likely still cannot recycle this material, but it is also not going to cause their equipment to come to a screeching halt, either. That was an interesting fact to know. No longer will I spend needless amounts of time to go find my scissors and then painstakingly cut out the plastic windows. Ok, I was never quite that careful. Nor would I spend needless amounts of time. Nor would I ever run to get the scissors (running with the scissors is a different story, however! )…I would usually just rip them out. But now I do not even need to worry about this. I just love technology. Another piece of information I learned was how to determine if something is really recyclable. Apparently, most products these days have a number listed somewhere on their packaging. This number ranges from 1 through 7. This is basically an indication of how easy something is to recycle. The author indicates that almost all recycling centers or facilities can accept anything that has the numbers one and two on their packaging. However, for other numbers you should check to make sure. It is also possible that some containers will not have a number at all. You may also want to check with a local grocery store to see if they will accept something that your local facility may not. Also, remember that most recycling at this point is focusing on paper and not so much on plastic. Taking a look at the packaging on all your paper products is an important step. The idea here is that a recycling facility will not generally accept a paper based item which does not dissolve in water. Therefore, if you feel the cardboard and there is a waxy or plastic like feel, it is probably not able to be recycled at this time. At the same time, if it is cardboard on even one side, it will probably be accepted. The author also points out another important factor. Before deciding to recycle something, try asking yourself if it is possible for you to reuse the item. Even if you cannot reuse the item, perhaps it could be donated somewhere that would welcome the chance to have it? Doing this is even better than recycling! It uses no energy to reuse or donate an item, whereas recycling does (even if it is significantly less than actually producing a brand new item). Additionally, it keeps all of the components of that particular item out of the landfill and does not contribute to any excess pollution. Thanks for the catch – we’ve changed “per say” to “per se” in the article. I was just cutting away on a stack of at least 100 envelopes and thought to check out the subject. Thanks for this article. While it’s nice to know I can recycle those pesky little plastic windows, it continues to torture me how much time we need to put in only to counteract all the crap the marketing companies are sending us. Really – if someone throws a newspaper in my driveway all of a sudden it’s my responsibility to pick up? That makes no sense at all. Those sending out unsolicited crap that harms the earth can burn in hell. I, too, was spending much time removing those pesky plastic windows! It is good to know that they are recyclable! Now I can spend the extra time on other things. Thanks for the information! Some locations now recycle paperboard, such as the paper/cardboard used in beer boxes and cereal boxes. Finally an answer to those pesky little plastic windows!! It takes me an eternity each day to cut out the windows – glad to hear they recycle and I don’t have to waste my time removing them anymore! Oh how I wish I could endorse the advice to leave transparent windows in envelopes for recycling. I have just spent hours tearing them out. In some areas it is permitted to leave them in….Hull for example while in others it is not… Aberdeen for example. Check with your Local Authority on their website or by phoning.